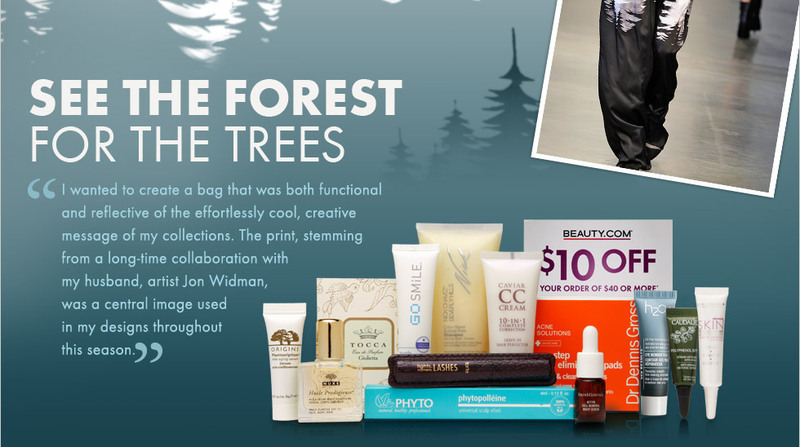 Beauty.com's latest collaboration with Tess Giberson features a new Winter Forest Bag, decorated with tree silhouettes in icy blue and black that comes filled with 13 prestige beauty samples in both deluxe sample and full sizes. The spacious, travel friendly bag and samples are a free gift with purchase on orders $125 and above. Here's what's in the bag. 14. An offer for you from the Beauty.com site ($10 off an order of $40 or more). I quite like beauty.com's collaborations, but I do wish this one came with a couple more makeup samples. It does have more haircare than skin or makeup, but some nice deluxe sizes like the Tarte Mascara and the Nuxe Huile Prodigieuse Dry oil. My bag also had a deluxe sample of the Alterna Perfect Iron Spray, but that is not listed as part of the contents of the bag. This sample bag is available as a free gwp until stocks last. For more info on this offer, visit beauty.com's offer page here! *Sample Bag and products provided courtesy of beauty.com. NO affiliate links have been included.